I enjoy knitting socks and over the years have knit many. However, until very recently I very seldom used 'sock yarn.' Having always lived in cold climates, I like my feet to be Toasty (yes, with a capital T) and therefore prefer to knit socks out of considerably thicker yarns - my favourites being Donegal tweed and Alpaca. I never thought anything of this, until, upon seeing some of these creations a knitting friend gasped - 'Are those not too delicate to be worn? Surely they would get immediately destroyed!' Since then, a few others have said this same thing. So... well, okay. Firstly, all hand-knitted socks - including those made of sock-specific yarns - are 'delicate' compared to the store-bought, super-dense machine-made knits such as say, the socks you would get from Smartwool or Ibex. If you walk in your hand-knit-stockinged feet outdoors or on rough wooden flooring, there is no sock yarn in the world that will endure that. It is also - despite what the 'superwash' label suggests - inadvisable to throw your hand-knitted socks in the wash or (gasp) the tumble dryer. In my experience (and of course YMMV, and all other standard disclaimers apply), the socks I knit out of non sock-specific yarns are no different. They are thicker and more textured (you can sometimes 'feel the stitches' around your feet, which is an interesting sensation to get used to) . And, on account of having zero nylon content, they are somewhat less stretchy. But more delicate they are not. 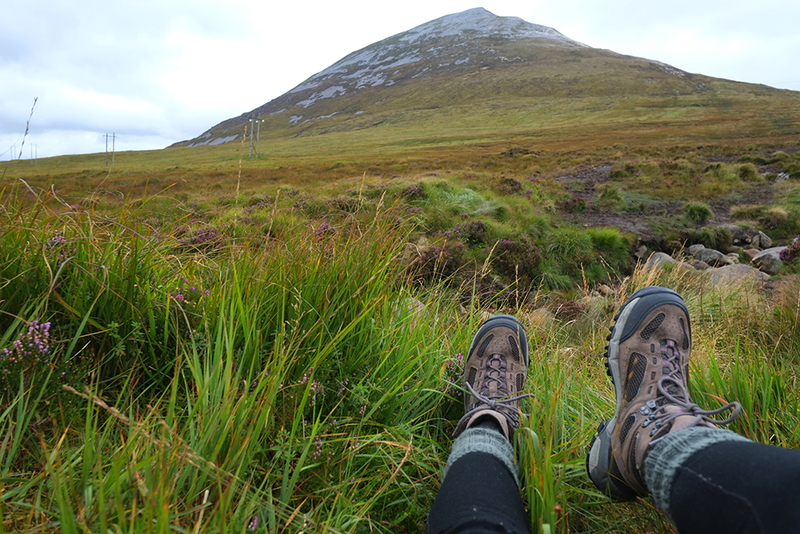 In fact, my husband and I both regularly wear the socks I knit when hillwalking, as they feel fantastic inside hiking boots. So: up and down soggy bogland for hours. Rinse and airdry afterward (I use sock blockers, but this isn't absolutely necessary). And they are fine to wear again. I spend a lot of time outdoors. Walking. Cycling. Standing (or crawling) around, waiting to take a photo. I find that the tweed and alpaca socks keep my feet warmer than 'sock yarn' socks, and that's why I love making them. They can't be worn with all of my shoes, but they do fit into most boots, including some of my dressy ankle and knee-high boots. The lifespan, if knitted densely and cared for properly, depends of course on how often I wear them but is generally equivalent to that of sock-yarn socks. If you are a knitter, what's the harm? Give your favourite yarn a try next time instead of sock yarn and see how it behaves. You will have to adjust the number of stitches of course, from whatever pattern you normally use. But experimenting is fun, right? And if you are considering purchasing some of my socks: Yes, they are delicate. As are all hand-knit socks. But they are also Errigal-tested! Please wear them boldly, read the Care Instructions in the product description, and don't hesitate to contact me if you have any questions.